Charming tea cup and saucer! What thoughtful, sweet gifts. I know that this was a special package filled with friendship in addition to the teas, chocolates, cards, etc. 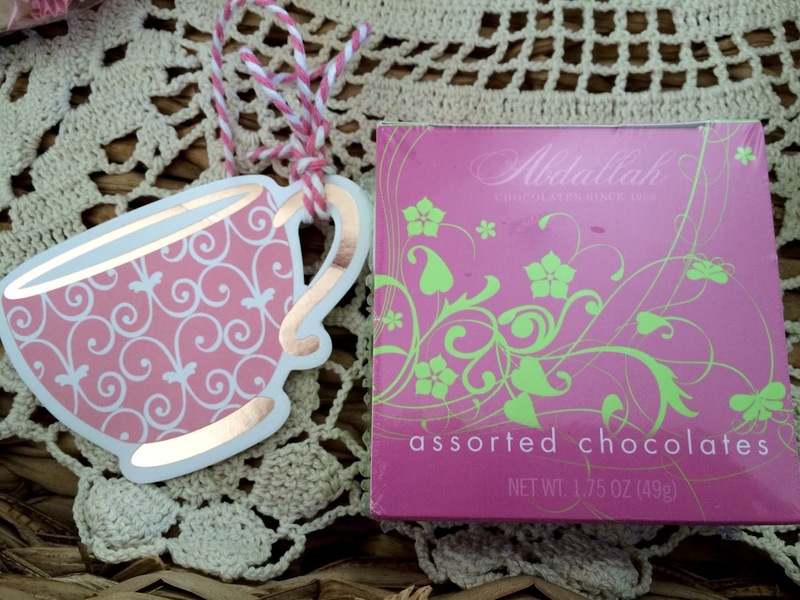 I love your gorgeous tea cup and the other goodies you received from the exchange. Have a wonderful time enjoying everything. Oh how wonderful! I love it! That is the sweetest teacup...I love cottage teacups! And such a lovely package of goodies! Thanks so much for linking to Tuesday Cuppa Tea! I love the cottage teacup from Deb. WHat pretty gifts to go along with it. You are a lucky girl!Enjoy your goodies. Hello, What fun it is to get a lovely gift in the mail, Can we ever have to many teacups? LOL I also really enjoyed my box of gifts I received, and made a new friend! Cottage teacups are my favourite too, Kitty! Your gift from Deb is just lovely and I'm sure you feel very pampered. Your thank you from Judith is beautiful as well. There are so many thoughtful and gifted blogger friends out there. I'm glad your teacup exchange was such a blessing for you. You deserve it! Thank you for sharing and have a lovely day, my friend. Oh my goodness I love it all. I need to take more time to have tea time. We drinks sweet orange tea on the front porch. Does that count? OHMYGOODNESSMYGOODNESS! Everything is soo lovely. I can't imagine how your heart raced to see the special-ness packed into your gifts. WOW! Love it all. Hi Kitty, oh what a lovely cup you received from Deb. She really treated you to special goodies and treasures. Deb is such a sweetheart and she thought of everything making your gift special. Love the gifts you received from Judith too.I look forward to visiting her as well. Enjoy the reveal and your pretty new cup. Have a great week. Kitty, the cottage tea cup is lovely and it will take you to far away places when you drink your tea. Exchanges are fun, to give and receive is always a joy. Blessings………. LOVE that teacup!! I would be doing the same thing, putting myself in the picture, and wandering around the lovely gardens. You received a wonderful package full of special goodies. I will have to visit Deb; I've not met her. Enjoy your tea Kitty! It looks like you hit the jackpot. I am loving your teacup too as the eye is so drawn the cottages these days! I know you will enjoy all these treasures you received and I am so glad you shared them and linked! What a wonderful package, Kitty. 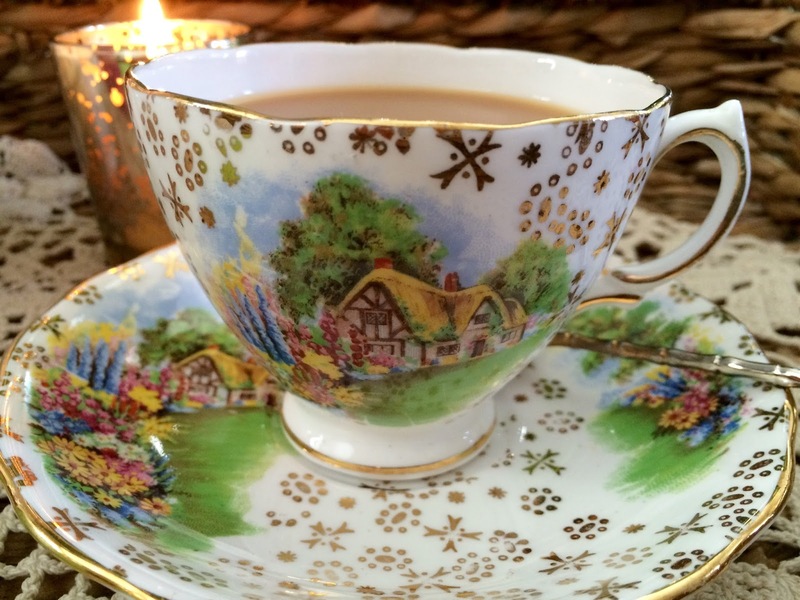 Your pretty Colclough Cottage teacup matches your Royal Vale Cottage teacup! 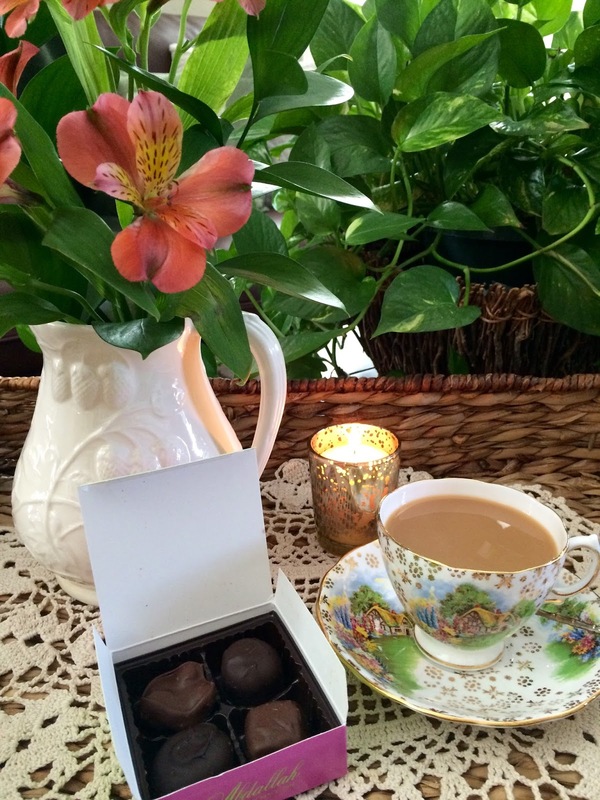 Tea and chocolates are the perfect combo and I'm loving the tea-themed notecards. 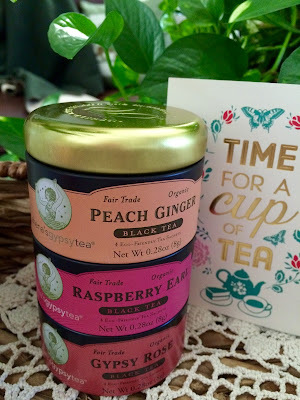 Raspberry Earl Grey is my favourite Zhena's tea. I look forward to seeing what you sent Judith! My, you too received a parcel with delightful gifts and the teacup is so pretty. I wish we could have tea together with our new teacups - all of us! 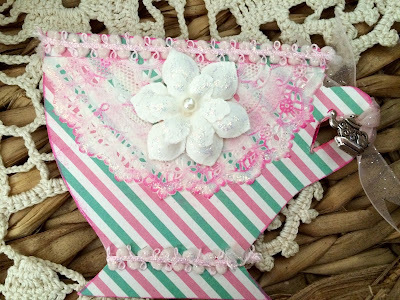 My post is up now, thank you again for everything you gifted me; your handmade card sits on our hall table. Oh my goodness, Kitty - your package is delightful! 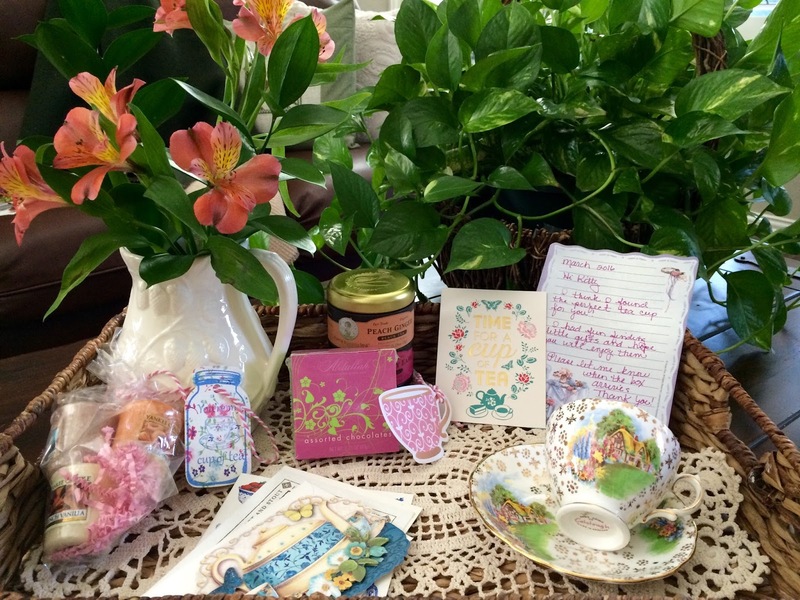 That teacup is so awesome, and all the handmade items, chocolates, candle - what treasures! And what a pleasant thing to open the mailbox to find a Judith hand-made card - she makes some of the most beautiful to behold. That is a beautiful teacup! You did receive a lot of goodies! I did too, and will be posting about mine later today! Oh wow Kitty, you really racked up, my friend!! This is great! That teacup is sooo pretty; you know how I love an English cottage! :) The cup is so dainty and colorful -- just perfect for spring. All your other gifts are so nice, too. 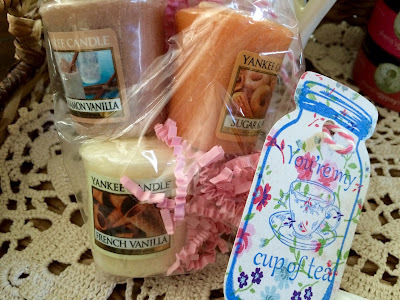 I do love the handmade gift tags, the little teapot charm, and the candles. I've already left a comment on Judith's blog about the lovelies you sent her. Everything was beautiful, Kitty. I hope you enjoy your tea and have a great week. Omygoodness...what a lovely, lovely gift package for you. The tea cup is just absolutely adorable...and everything else is so perfect. Wonderful gifts. Lovely experience for you. I know this has been a fun event to participate in. Stephanie does a beautiful job of coordinating.Love your goodies. Your teacup is precious! I love that little thatched roof cottage! I saw a teacup in a shop that was very similar but it had been turned into a bird feeder. Gasp....as I wanted to add it to my collection! Love all your other goodies too. I also saw the package you sent off--so pretty and lavender!!! I am already looking forward to the next swap, so much fun, isn't it? Have a lovely day! Isn't this fun? You received such a beautiful gift and also sent such loveliness. Enjoy your tea sweet lady! Oh this looks like so much fun! I hate I missed it! I'm going to mark my calendar so I will be sure to sign up. That teacup is so adorable! I can tell you Ladies are having fun, so neat! What a lovely parcel, filled with delicious, beautiful, and thoughtful gifts. The Colcough teacup is so pretty. Oh I would love to live in that cottage! Such a sweet teacup! All of your gifts are so special. 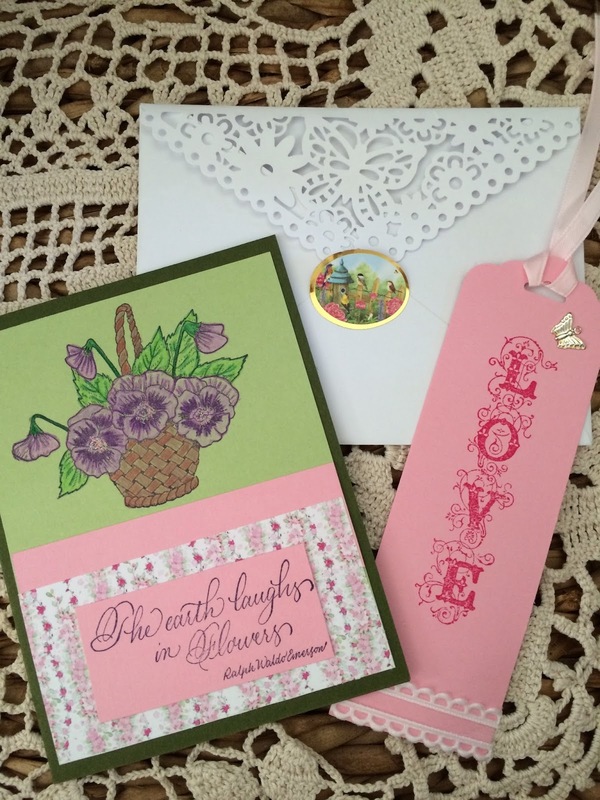 I adore the handmade cards and special stationery you received. It's so wonderful to see all of the tea themed cards and labels. Such fun! Happy to see you here with us at TOHOT! Oh, Kitty, what a special event for tea lovers like you! The gift you received is incredible, so many detailed and thoughtful touches! And the thank you note you received, just amazing! I know you will enjoy your beautiful new cup in your collection! Oh Kitty I am green with envy over that teacup. Deb is such a delight. What an absolute charming post is!!! Thank you so very much for joining the gathering at Thoughts of Home on Thursday. Indeed, be still my heart! The tea cup is divine, my friend! And I can see why you would pretend you live in that sweet little cottage as I would too :) Deb is one of the sweetest bloggers so I am not surprised at her delightful package of love. And you, sweet friend, sent a wonderful package to Judith! 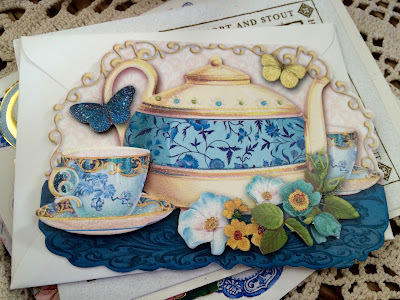 I loved seeing her post with the handpainted tea cup and saucer. You have a heart of gold to send her something from your collection. THANK YOU for joining the 8th Tea Cup and Mug Exchange. How I LOVE having you be apart of it :) Much love to you! Enchanting tea cup and Raspberry Earl Grey? Yum, that sounds divine. This was my first time taking part and I had a wonderful time and hope it continues for years to come! Kitty, love that cottage teacup! This exchange sounds like such fun. I wonder if Stephanie had any idea the first time that it would get so huge! The teacup you received is absolutely stunning! What a gracious gift from Deb. Several years ago, when I was authoring a "beautiful things" blog, I took part in a giveaway hosted by Deb, the Garage Sale Gal. She has exquisite taste in gift-giving. Oh...Kitty! I am so delighted that you were graced with such a beautiful teacup...it is exquisite! Deb blessed you with a lovely package and oh! All the goodies are too sweet! I love this exchange ~ Stephanie is a dear to host! Blessings and all my love to you, Kitty! Kitty, I love seeing all the tea treasure reveals! They are all so unique and beautiful. You received such beautiful gifts. Love your little cottage teacup! Thank you for sharing with us. Beautiful teacup from Deb! She's simply so wonderful and creative with her packages. Hi Kitty! What lovely tea cups and things! How nice to receive so many beautiful things. Thank you so much for popping in to see me and your well wishes. I hope you're doing well. I've enjoyed seeing all the cute teacups in this exchange. Wow you were spoiled!!! That Teacup is BEAUTIFUL!!!!!! Enjoy your day! That is a gorgeous teacup! A fellow blogger has been using the picture from this same teacup for her blog header. You received lots of special treats to go with the teacup too. Judith sent a beautiful card and bookmark to you (Judith and I have met in person last summer). Have a wonderful day Kittie!